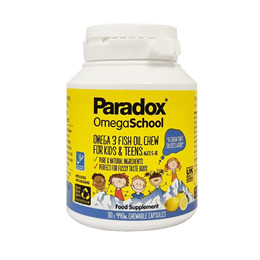 Paradox OmegaSchool - Omega 3 + Vitamin D3 & E contains lemon chews full of natural Omega 3 fatty acids and powerful antioxidants found in oily fish. It may support normal brain and vision function for children and teenagers between the ages of 5-18. Just one of these clever, little lemon chews taken daily contain the natural omega 3 fatty acids from one portion of oily fish. These fatty acids and antioxidants derived from pure fish oil are founded in the Arctic and South Pacific Oceans, sourced with extra virgin olive oil and a dash of organic lemon oil for extra protection. Full of Omega and Vitamins, these lemon chews are perfect for growing minds and fussy taste buds. Pure fish oil, Pure extra virgin olive oil, Pure organic lemon oil. Capsule: Fish gelatin bp, Glycerol bp (Halal/Kosher), Lemon oil bp, Maize starch, Cellulose, Yellow iron oxide, Sucralose. Children aged 5-18: Take 1 chew daily. The preferred way of taking the chew for a younger child is to chew the capsule until the lemon flavour bursts out and then carry on chewing the capsule as it turns into a lemon flavoured pastel (with no fishy taste or smell). An older child can swallow the capsule whole as an alternative method. 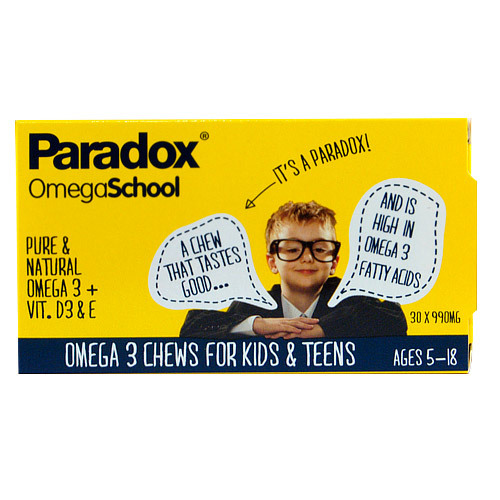 Below are reviews of Paradox OmegaSchool - Omega 3 - 30 x 990mg Chews by bodykind customers. If you have tried this product we'd love to hear what you think so please leave a review.